Right opposite the River Windrush, sits this little unique and quaint village tea room and is extremely well inviting from the front. Lovely table cloths, topped with real cream lace table cloths surely makes this tea room built with Joe Ellis in mind! Lovely open fire effect surrounded by book cases, tall and short with old style books; (Sandra would have to be dragged out!!) old vintage radio, two tone décor which is separated by white top and red bottom walls separated daido rail. 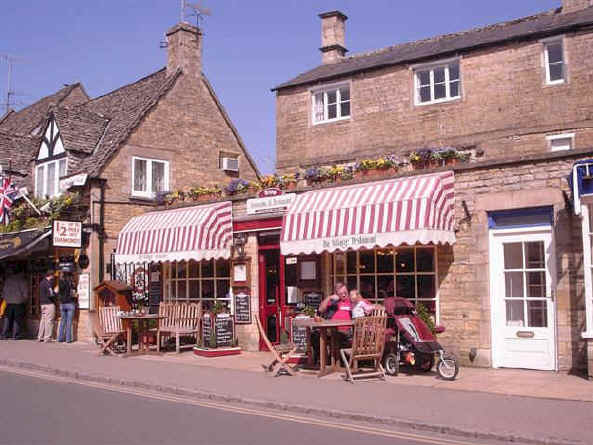 Lovely old pictures of Bourton on the Water in antique effect covers the walls. The unusual curtains of red and cream makes this tea room appealing and inviting. Patterned green carpet supplemented the tables as well as the old style lamps and ceiling lights gives the appearance of a yesteryear English tea room. The only downside is the fake red roses and if these were real would make the feel even better. The usual tea room menu was available and I arrive for a morning tea as soon as it opened which was peaceful and quiet. This tea room converts to a restaurant from 7pm and I would loved to have tried it. Beautiful and quaint little English tea room which I must highly recommend to everyone.